The 46.22 metre sailing yacht Pink Gin, listed for sale by Frank Grzeszczak and Katya Jaimes at IYC, has been sold with Marc Haendle at Ocean Independence introducing the buyer. Designed by Judel-Vrolijk, she was built in GRP by Baltic Yachts and delivered in 2006 as a high performance sloop and refitted in 2011. An interior by Design Unlimited has a nautical theme and is contemporary without being cold, using mahogany and leather paneling throughout. Accommodation is for 10 guests in five cabins. The owner’s area is all the way forward and has a large cabin along with a bunk-bedded children’s cabin. Aft of this are two VIP suites, a double to starboard and a twin to port. The third VIP suite is situated aft of the saloon and has a large double bed. All cabins have full en suite bathroom facilities. The large upper saloon has comfortable seating and full dining facilities from a gourmet galley while there is also a lower saloon for more relaxation and conversation. The navigation and communication equipment is located on the starboard side of the upper saloon. On deck, a large guest cockpit forward offers al fresco dining, fitted out with upholstered seating and a dining table while aft is a working cockpit with the helm station. Under power, a single 873hp Caterpillar engine gives her a range of 2,900 nautical miles at 12 knots. 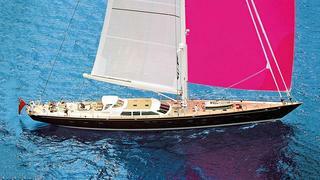 The sale comes at an opportune moment, as her successor, Pink Gin VI, was recently launched. Pink Gin was asking €8,900,000.